Create multimedia lessons by adding images, video or audio. When working in your lesson, you can embed images, video, and audio to your writing assignment response. There are a lot of great resources to find the exact image or video you're looking for. To include images, video or audio, in a content space, use the 'Insert Audio'. 'Insert Video', or 'Insert Image' options from the formatting bar. Make your class visual by using images. You can choose to upload an image or link to the image URL. 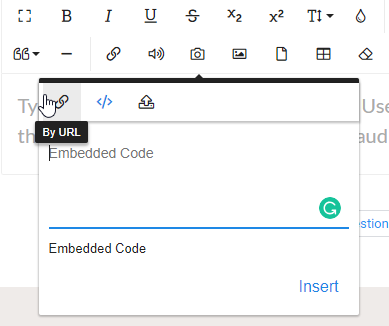 You can embed videos into your assignments, from sites like Vimeo and You Tube (by linking or including the embed code provided by these sites) or just upload your video directly. 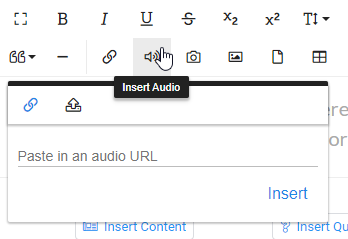 You can include audio into your assignments, as well. You can provide the URL of the audio file or directly upload your audio files in your lessons.